It was early. The house was quiet and dark. I carefully turned the knob on my son's bedroom door to wake him up for school. He was sitting, cross-legged, in the middle of the bed...in the dark. I smiled and whispered Good morning Sunshine. He replied, Is it morning already? It turns out that after he had gone to sleep the night before, a random car driving by our house honked for some reason and the sound woke him up. My son looked at the clock then. It was 10:37 at night. He never went back to sleep. It was now 6:10 in the morning. I gave him a melatonin pill and held him in the dark for a few minutes until he fell asleep. He slept for a few hours and woke up renewed. I was surprised and concerned because he only slept a few hours and he normally needs eight to ten hours of sleep...it is how he recharges. I fed him breakfast and suggested he go back to sleep for a few more hours. Oh no, I'm fine. He explained that sitting in the dark was peaceful and quiet, that somehow he was not tired. He inadvertently meditated. It is this quietness that he experienced that mutes the chatter in our mind and allows us to wind down, release stress, anxiety, worry and thoughts of fear. 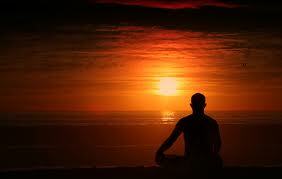 In meditation there's an unspoken agreement between you and Spirit. You sit in silence, Spirit nurtures you. My son was restored after a night of sitting quietly in the dark. Amazing. Our lives are continuously noised about with television, radio, cell phones, internet, loud speakers, loud cars, loud people, loud voices and our own minds. If we take a few moments to sit quietly and do nothing we will find renewal and a sense of peace. If we practice a few moments of silence each day we will experience the cumulative effects of meditation–lower blood pressure, restoration of body and spirit, a lasting sense of calm and a sharpened intuition.